President Obama today signed his comprehensive health care overhaul legislation into law, marking the most significant legislative accomplishment of his presidency to date. "Today, after all the votes have been tallied, health insurance reform becomes law in the United States of America. Today," Mr. Obama said from the East Room of the White House. "The bill I'm signing will set in motion reforms that generations of Americans have fought for." Mr. Obama hailed "a new season in America" in which "all of the overheated rhetoric over reform will finally confront the reality of reform.'' The legislation, Mr. Obama said, enshrines into law the "core principle" that everyone should have some health care security. After more than year of passionate debate, partisan politics and substantive policy discussions, Mr. Obama saw through his top domestic priority, even as it weighed down the Democratic party politically. The House of Representatives on Sunday passed the health care reform package initially passed by the Senate, but only by a slim margin of 219 to 212, demonstrating the potential damage the bill could do to Democrats from moderate districts. A CBS News poll released Monday night showed that most voters, questioned in the days before the House vote, said the passage of the legislation would be an accomplishment for Mr. Obama. Nearly half of Americans, however, said they did not support the legislation, and only 20 percent said they expected to benefit from the bill. Meanwhile, 57 percent said congressional Democrats were trying to pass the bill for "mostly political reasons." In the wake of the president's victory, however, his allies were exuberant. Mr. Obama and Vice President Joe Biden strided into the East Room to the raucous cheers of an audience of about 600 people, including health care advocates, doctors, nurses, Americans with health care challenges, members of Congress, administration officials and members of the cabinet. "Fired Up! Ready to Go!" the crowd chanted, reviving the president's campaign cheer. "Mr. President, you've done what generations -- not just ordinary but what great men and women -- have attempted to do. Republicans as well as Democrats," Biden said, before Mr. Obama signed the bill. "The clarity of purpose, your perseverance -- these are the reasons why we are assembled in the room together." After signing the bill, Mr. Obama went to the Department of Interior, to thank even more of his supporters. "We wanted to do this twice because there are so many people we have to thank," he said. Mr. Obama acknowledged in the East Room today that some lawmakers have "taken their lumps" for defending the health care legislation, to which someone in the crowd yelled, "Yes, we did!" The allusion to Mr. Obama's campaign slogan "Yes, we can" prompted laughter from the audience. The president praised congressional leadership for seeing the legislation through, calling Nancy Pelosi "one of the best speakers the House of Representatives has ever had," spurring the crowd to cheer "Nancy, Nancy!" Mr. Obama also called Harry Reid "one of the best majority leaders the Senate has ever had." The president does not intend to give up his efforts to boost support for the legislation. On Thursday, he will travel to Iowa City, Iowa as part of a campaign to sell the bill's benefits to citizens and small businesses. The opposition, however, also plans on continuing the fight. Republican lawmakers are already calling for the repeal of the bill and some state attorneys general are suing the federal government over the provision in the legislation mandating that all Americans acquire insurance. House Minority Leader John Boehner said in a statement today the GOP will "stand on principle" and fight to repeal the legislation. "This is a somber day for the American people," Boehner said. "By signing this bill, President Obama is abandoning our founding principle that government governs best when it governs closest to the people. Americans have never felt more disconnected from their government than they do today." Mr. Obama, meanwhile, has framed the passage of the legislation in a historical context, conjuring up the political will of Abraham Lincoln and calling the measure "the single most important step that we have taken on health care since Medicare." Today, Mr. Obama said he was signing the bill on behalf of his mother who died of cancer at a relatively young age, on behalf of those who are struggling in the current health care system and on behalf of lawmakers in the past who fought for reform like former Presidents Harry Truman, Lyndon B. Johnson and Bill Clinton, and former First Lady and current Secretary of State Hillary Clinton. 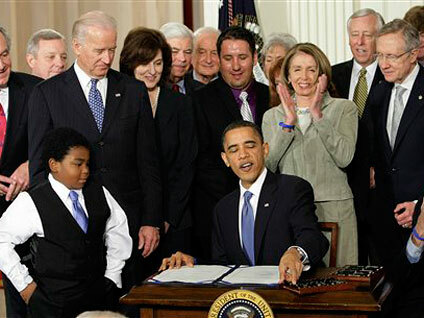 To mark the legislation's significance, Democratic congressional leaders joined Mr. Obama at the signing table, as did figures representing the fight for health care reform. Those individuals included Vicki Kennedy, widow of the late health care champion Sen. Ted Kennedy (D-Mass. ); 11-year-old Marcelas Owens, a spokesperson for health care reform whose uninsured mother died of a treatable illness at the age of 27; Connie Anderson, whose sister is battling Leukemia without health insurance; and Ryan Smith, a small business owner struggling with the rising costs of providing insurance for his five employees. The bill creates sweeping changes to the nation's health care system. Under the health care bill, most Americans are now required to have health insurance. The government will help people pay for it by expanding Medicaid and giving out subsidies and tax credits. It will expand coverage to 32 million Americans who are currently uninsured and create a system of state-based exchanges where individuals and small businesses could pool together to negotiate for better insurance prices. The bill will create new taxes to pay for the plan, such as an excise tax on high-priced insurance benefits and a tax on unearned income for wealthy Americans. It will also institute strict new insurance regulations, such as prohibiting insurers from discriminating against customers with pre-existing conditions. Mr. Obama acknowledged most of the significant reforms will take years to put in place. "We need to implement them responsibly," he said. "We need to get this right." He noted, however, the reforms that will go into effect this year, such as the tax credits for small businesses to provide insurance to their employees, the closure of the Medicare "doughnut hole" gap in prescription drug coverage, and some insurance regulations such as prohibiting insurance companies from dropping customers once they become sick. While this significant piece of legislation is now signed into law, the health care debate is not yet over. The Senate this week will debate a reconciliation bill meant to amend certain parts of the health care legislation. The reconciliation bill was already approved by the House and only requires 51 votes in the Senate. Reid said he hopes to pass the bill by Saturday. Democrats in the Senate will have to get past hundreds of proposed amendments from Republicans in order to pass it. "These are improvements I'm confident they will make swiftly," Mr. Obama said, prompting loud cheers from the legislators in the room.